(Newser) – As Samsung's stock plummeted crazily today, Apple was busy kicking its rival while it's down a billion dollars or so: The Cupertino tech giant today filed papers asking a court to extend a ban on US sales of Samsung's cell version of the Galaxy, reports Bloomberg, in response to Samsung's request yesterday that the ban be lifted. Samsung also said it was looking to recoup losses it suffered since the ban was wrongfully enacted June 26. You know I was just about to switch from my android to the new iphone 5 and after seeing this I think im going to get a new samsung galaxy 3 before i cant get one. Its a shame that Apple would do something like this and the phones dont even look the same. 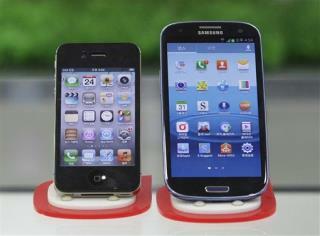 Obviously the samsung is much nicer and larger, the iphone maybe good for women or little tiny guys. F**K Apple, this is a free market society and they are trying to monopolize the market. Why would anyone support apple?